We all know how important a bright, white smile is. 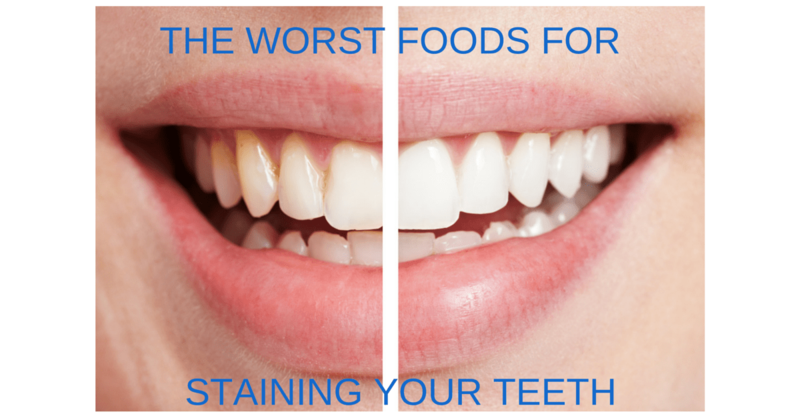 And while we all know that a daily routine of brushing and flossing is key to keeping those pearly whites white, there are certain foods to keep in mind that can actually stain your teeth. Actually, many of the worst “foods” are actually beverages. Basically, anything that can stain a white tablecloth can also stain your enamel, and the more intensely coloured a food is, the more staining potential it has. The colour of these foods and beverages comes from chromogens – highly pigmented molecules that latch onto the enamel of your teeth to cause stains. The acidic level of the food or beverage is another factor to consider. When your teeth are exposed to acid, it softens the enamel and allows the stain to penetrate more deeply into the tooth. So foods that are highly-pigmented AND acidic are likely to cause stain. Finally, if a food is high in tannins – a food compound that increases the choromogens’ adherence to tooth enamel – it boosts a food staining ability. So foods that are highly-pigmented, acidic, AND full of tannins…well, you get the idea. Red wine: Ding, ding, ding. This one scores high on all the categories listed above. Interestingly enough, white wine, due to its acidity, contributes to staining as well. If you were to drink white wine and follow it by eating/drinking something that’s intensely pigmented, it makes your teeth more susceptible to picking up that color. (That goes for anything that’s acidic). Tea: Not only is tea highly-pigmented, it’s also rich in tannins. Note: herbal, green, and white teas are less likely to stain than black teas. Coffee: Definitely a major culprit for most of us, but believe it or not, it may not be as bad as tea is for staining. Coffee is high in chromogens, but lower in tannins. Cola: This is one that people may not generally think of, but it’s chromogen-rich and VERY acidic. Sports drinks: Mostly due to their high-acidity, they soften the enamel and set the stage for staining. Berries: If you eat a lot of intensely-coloured fruits, your teeth can take on their coloring. Sweets: Candies, popsicles, gum, etc. that contain food colouring agents can easily stain your teeth. Just think, if your tongue turns green from eating a hard candy, that same colour can stain your teeth. However, many of these foods (not including soda, sports drinks or candy) have many health benefits and are high in antioxidants, so you may not want to eliminate these foods from your diet completely. Enjoy everything in moderation. You can use straws to limit the exposure of certain drinks in your mouth. And you should avoid swishing or holding things in your mouth too long – the longer foods/drinks stay in contact with your teeth, the more chance they have to stain them. Also, try rinsing with water afterwards. In fact, it’s best to hold off brushing your teeth for 30 minutes after eating acidic foods, since brushing can be too abrasive against the softened enamel. If you suffer from stained teeth, don’t worry. Ask your dental professional about different whitening options to get rid of the stain and restore your dazzling smile.